Those Ancient Stone Tools — Did Humans Make Them, Or Was It Really Monkeys? : The Two-Way Capuchin monkeys in Brazil have been seen making sharp stone flakes. It was previously thought that only humans and their ancestors had flaking skills. Capuchin monkeys use a detached flake as an active hammerstone, possibly in order to produce quartz dust. 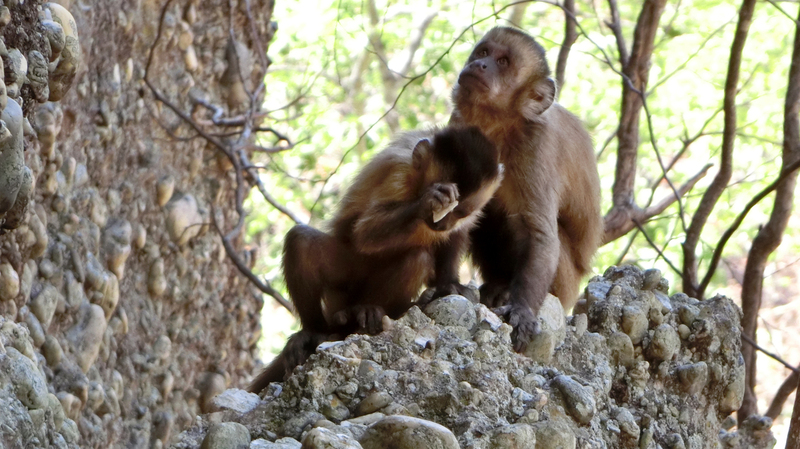 Scientists saw a group of capuchin monkeys making stone flakes, an important type of early tool. It's not clear the monkeys knew what they were making, but nonetheless, it might prompt researchers to be more cautious when they come across ancient sites where similar tools are usually attributed to early humans. You make a flake by whacking two rocks together. It has to be a kind of rock that breaks in a certain way, and you have to hit one rock on another rock to break flakes off the striking rock. The flake is shaped kind of like a scallop shell. Hold it carefully and you've got a knife. The oldest toolmaking like this dates back 3.3 million years and has always been attributed to early humans or, perhaps, our more primitive ancestors such as Australopithecus or Kenyanthropus. But anthropologists in Brazil filmed capuchin monkeys doing this very thing. Easily. And gleefully. Paleoanthropologist Tomos Proffitt from Oxford University watched them do it. He was expecting to see them crack nuts with rocks. "Capuchins do nut-cracking," Proffitt says. "They crack open palm nuts all the time. So we were looking for this." It's something chimpanzees do, as well. But instead, the capuchins were whacking one rock on top of another. "We saw this, doing this stone-on-stone percussion, and that was quite exciting looking at the material they produced. ... It was sort of a jaw-dropping moment." Jaw-dropping because they were chipping off flakes. No one has ever seen a monkey doing that. Nuts, sure, but stone tools? Well, actually not. Here's the thing: The monkeys have no idea what to do with the flakes. They're breaking those quartz rocks so they can lick the insides. "We hypothesize that it's something to do with getting minerals from the quartz because they lick the dust, they ingest it," Proffitt says. Or another possibility is that they're trying to get at the lichen that grows on many of the rocks in the forest, which might be nutritious. Whatever the case, they ignore the flakes. So we can all breathe a sigh of relief knowing that monkeys aren't as smart as our early ancestors were. However, writing in the journal Nature, Proffitt says the monkey flakes should put field scientists on notice not to be confused by monkey flakes that might look like human-made ones. He says the ones made by early humans are "more complex than what we see with the capuchins, though they share the same basic characteristics." Proffitt adds that there are usually clues found along with ancient tools that suggest that, unlike the monkey flakes, they were actually used — cut-marks on nearby bones, for example. The discovery does reinforce other research showing that nonhuman primates do use tools, if only occasionally. Erin Marie Williams-Hatala, a biologist and expert on stone tool use at Chatham University, notes that the method the capuchins use is admittedly more primitive than what early humans most likely used to make flakes. But it shows a higher level of thinking than usually attributed to monkeys. "We are constantly erecting false barriers between our mental and manipulative abilities and those of other animals," she says. "But the truth is far more blurry." John Shea, an anthropologist at Stony Brook University and an authority on stone tools, says it's important to remember that humans were "obligate" tool users — it was an essential part of being human — whereas "technological primates," as he calls tool-using chimps and capuchins, are only occasionally using them. Most nonhuman primates don't use tools, he notes, and even those that do apparently don't refine them over time to improve their usefulness, as human ancestors did. But watching the films the scientific team made of the capuchins in Brazil, there's no mistaking the earnestness of their rock-banging, whatever the reason for it.